I went to Eden Park for the first time in several years on Saturday. 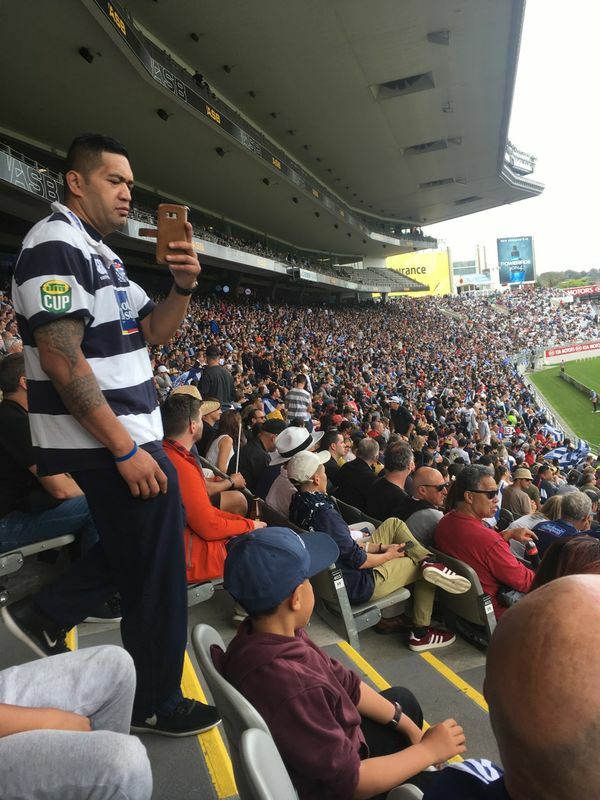 I used to go all the time, but I'd become disillusioned with Auckland rugby at both Super and provincial level – the turning point, ironically, was the year I bought a Blues season ticket – and my former rugby buddies had moved away, or just moved on. I wasn't someone who went to sports events any more. But when Auckland Rugby announced that the Mitre 10 Cup final would be free to enter, I heard a rallying call. Against all predictions, my underperforming team had finished the premiership season at the top of the table, playing courageous and focused team rugby, usually to modest crowds. Perhaps it would be proper to acknowledge that. We set out for the park about 3.30pm and weren't alone on the journey. It wasn't a test match crowd, but it was a group of people with a common purpose. There was a bloke outside in an umpire's chair whose main job appeared to be just welcoming everyone to the ground. It seemed a nice, quirky touch. After we passed through the turnstiles, stewards were telling people to head for the West stand, which seemed odd. It turned out that organisers had kept half the park closed in order to concentrate the crowd in the ASB stand. That was almost full, so they were overflowing to the two end-on stands. We did find seats, including one for Alan's mate to join us, in the ASB stand, and if you kept the empty South stand out of the picture, it looked like a bit of a happening. Alan went to get us a beer. I may have been a bit dazed (the night before had been a late one with old friends who live high in the Waitekeres), but I'd been there about 10 minutes before I realised The Feelers were playing. Sure, I'd been somewhat aware of there being Feelers songs, in the way one is aware of there being Feelers songs at the supermarket or on hold to a government department. But there they were, chugging away on a little stage over at the half-way line. I actually don't want this to be some variation on a Feelers joke. It was good of Auckland Rugby to put on free music before the free game. I don't begrudge the band a payday either. But they really were the wrong booking. Although, like Alan and I, most of the crowd could have afforded tickets, there seemed to be quite a few family groups taking advantage of the offer. And a lot of those kids were brown kids. That's important, because the Auckland team's coaching staff and and core players are Pasifika and Māori too. That's the Auckland the the union should be looking to capture, and here they were. Presenting them with the whitest band in the land, whose last chart single was 12 years ago, just didn't fit the picture. It became evident that one problem with the day's seating configuration was that hardly anyone had a view of the larger of the ground's two video screens. The other one, diagonally opposite us at the corner of the South and East stands, looked awfully small to my ageing eyes. Also, since the park was remodelled for the World Cup, the ASB stand is quite a long way from the touchline. To make matters worse, the play would run resolutely away from us for much of the game. It seemed a conscious effort to stay engaged at times. Auckland were awful in the first half. The occasion seemed to be messing with players' heads. They made poor decisions and dropped or kicked away the ball almost as soon as they won it. A team that had muscled it up the middle of the park all season was suddenly trying to outflank Canterbury direct from set piece, and it wasn't working. Individual decision-making was a shambles. But they held on in defence, and for quite a long time, Canterbury's smooth, structured attack could find no way through. Then it did, and again, and after 32 minutes Auckland were down 17-0 and I presumably wasn't the only one wondering if I'd leg it during the second half and beat the rain. The more so given that Canterbury's second try, a penalty try awarded against Akira Ioane for collapsing a maul at the end of an exhuasting spell of goal-line defence, came with a sin-binning. When Auckland did score a try, it wasn't through anything like structured, patient play. On almost their only trip to Canterbury's 22, they forced an offside penalty. The obvious thing to do was kick it and at least get some points on the board. But TJ Faiane made a quick tap and was held up a couples of metres from line when he offloaded the ball to Manu, screaming up on his left, to crash over. Even when Canterbury kicked a late penalty, it seemed like 20-7 held some hope for a miracle second half. In the meantime, the forecast rain had begun. The Feelers toiled away under cover during the break, not helping the mood. And increasingly, the gloom was more than philosphical. There was no sign of the ground lighting coming into play and I wondered how dark it was going to be by full time. Something else had happened. Although most of the crowd was well-sheltered (the weather was coming from the north, behind the ASB stand), people in the West and East stands were getting wet. Whoever was in charge noticed, and stewards opened the gates to the empty South stand. All but a half-dozen diehards in the West stand took up the offer. It was a good gesture, one that said that Auckland Rugby was thinking about its supporters, and its maybe not something that would have happened in past seasons. Auckland scored again – another quick tap! – after, for the first time in the match, actually hanging onto the ball for a few minutes. By this time, the rain had become very heavy indeed. 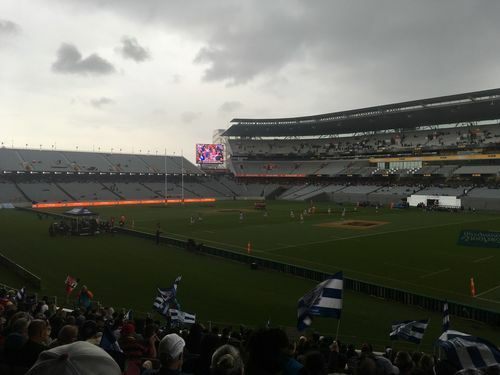 It was thick, tropical Auckland rain and it seemed that Auckland knew how to play in it better than the visitors did. They started muscling it up the middle like they had not done in the first half. Canterbury scored again and with 20 minutes to go, a 14-point lead was looking pretty good for them. Thirteen minutes later the scores were level and it was Auckland looking to close it out. The ground DJ had finally found the hip hop playlist and an Auckland crowd was well over the line into enthusiasm. To match the mood, the lights finally came on and the play became a lot easier to watch. Auckland thumped away in front of the posts as the minutes ticked away. "DROP GOAL!" said everyone in the crowd. But it seemed they couldn't find the confidence to take their moment. And a second after the full-time hooter, one of the forwards dropped the bloody ball. It was quickly announced that there would be two 10-minute halves of extra time. That didn't start well. Canterbury scored a try and drew ahead. Auckland equalised, again from close range. What hardly anyone at the ground knew was that that's all Auckland needed to do. If the game finished at 33-33, they, as the team with the most tries, would win. It didn't come to that. After trying all game to get behind the Canterbury defence on the outside, Auckland finally actually did it. Melani Nanai scorched down the field and got the ball away to Fukofuka to score. 40-33. After an agonising four minutes, in which Harry Plummer missed a penalty that woud have put it beyond doubt and the ball changed hands several times, it was over. Auckland had secured what had at one point seemed a vanishingly unlikely victory. The Auckland bench charged onto the pitch like madmen, slipping over on the flooded turf like they didn't even care. The rest of us barely knew ourselves. Outside the gate, a car full of young guys went past, honking and cheering. We shouted back at them. It was all very unlike an Auckland crowd. But in the course of an afternoon that seemed to go on forever, perhaps we'd changed. By the time I got to my bike, the rain was getting heavier again, and I got pretty soaked on the short ride back to Point Chev. But I didn't really care. There were dry clothes and a curry I'd prepared earlier waiting for me, and an All Black test on the telly. I knew I'd been there for a day at Eden Park that people would talk about for a long time. So how did it go for Auckland Rugby? You'd have to say it was a success. One sportswriter suggested that a crowd of anything less than 30,000 for a free game would be a flop. But that's not realistic. For goodness sake, Canterbury didn't crack 10,000 at their own home final last year. And we're into Auckland's events season, when there's a lot of competition for dollars, time and attention most weekends. Herding us all into one stand was a good call, as was opening the South stand to let everyone stay dry after the rain started. The weather put paid to a plan to allow kids onto the ground afterwards – and the idea of families pinicking in the middle of the ground and watching the test on the big screen clearly wasn't a starter. I'm not sure if it ever was, but it did show an organisation thinking about the people it was serving. 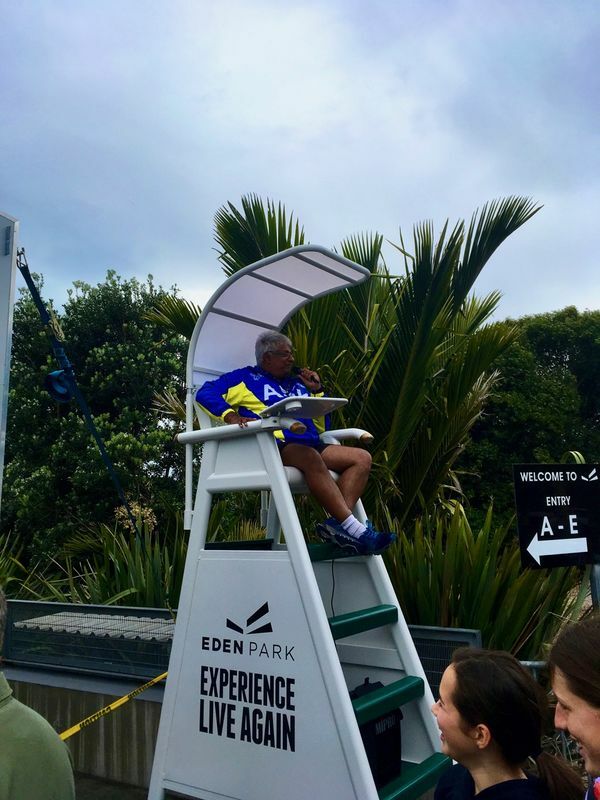 On some level, Eden Park is the problem. It feels corporate and concreted. There's a whiff of white elephant. It's a very difficult to place to build a community. But any resolution to that is a long way off yet. For now, Auckland Rugby and its CEO and board should feel happy with their experiment. They should be thinking how they can make things even better next year – and the Blues should be paying attention too. Tap into the city's young, vibrant cultures, put on entertainment that reflects that. Keep finding ways to deal with the size of the stadium. Maybe do some mad stuff. I can remember the NPC games where the cheerleaders would arrive on the back of Harley Davidsons and skydivers would swoop in and land between the uprights. Focus on being there for the fans and not just the sponsors and boxholders. And keep ticket prices reasonable. Congratulations, finally, to the Auckland players and their coach Alama Ieremia. It's been a remarkable season, one in which I, a disaffected fan, gradually came home. They'd been a long time in the wilderness and it felt like nearly everyone was pleased to see them back. The Taranaki union tweeted congratulations, Steve Hansen made a point of praising them in his post-test match interview. I promise I'll come to more games next year. Hell, I might even go and see the Blues. It was a great game; more exciting than the AB test which followed, We recorded the final 10 minutes, in order to set out for Cambridge to see Show Me Shorts, and returned to watch the play in extra time. Great too that Waikato have been promoted back to the Premiership, after a great run, Exciting young players are to be seen. Yes, even for a fellow exCantabrian, last Saturday afternoon was really enjoyable. Well done ARU. That game was a great payoff for years of ARFU membership. And hopefully bodes well for the Blues. If only 30% of Sats attendees turn up regularly next year, that is a win as well. The shape and set up of Eden Park does mean almost all seats are just too far from the action. Closest, with a view of the shape of play, is the upper West, where I've watched all the test matches for last 7 years - on my membership tickets, in the same front row seats behind the sticks! I was at home brewing beer with a mate who had 20 bucks on Ioane to score and Auckland to win…Needless to say it was an up and down and a bloody great game to watch! Evan Olmstead not named in the 2019 Blues squad. Boo. And no Sevu Reece for the Chiefs. Double boo!